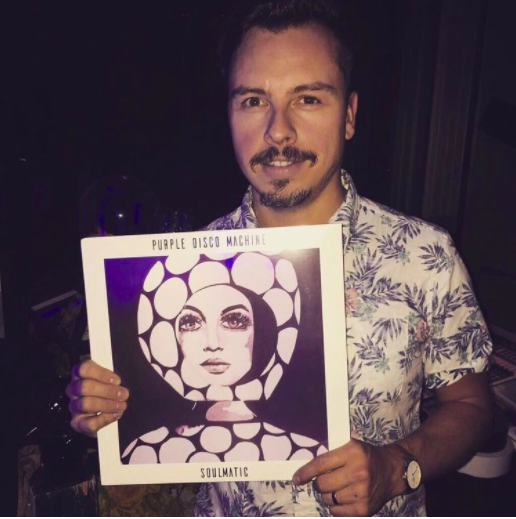 Purple Disco Machine makes a big disco splash as he releases his debut Album ‘Soulmatic’. We take a closer look at the madness within. There’s certainly something to be said for the stereotype of German efficiency, because Dresden’s own Tino Piontek a.k.a Purple Disco Machine has been churning out records like…well, like a machine? Piontek just recently let loose his debut album titled Soulmatic, the product of three years of hard work and collaboration and it’s safe to say there’s nothing purple about it – it’s gold. A quick look at the track list and we instantly recognise some fairly big names, including Cee Lo Green, Faithless and Kool Keith, so we know that we’re in for some pretty varied works. The albums first track Music in you featuring Lorenz Rhode is a questionable opener. For the first minute, I was all in. A short opening segment of the evening sounds of a city street, a classy fade into a gorgeous and mesmerizing build, before dropping into a future-funky bassline. So far, so good – but then the vocoder vocals came in, and unfortunately wrote off the song. The lyrics were cliché, and were what someone would write if they were told to think of stereotypical lyrics associated with having a good time at the discotheque. “Go crazy…It’s Friday night” just didn’t sell, and certainly clashes with the originality that Piontek consistently brings the table. Maybe it’s because Daft Punk popularised the vocoder effect (think Harder, Better, Faster, Stronger) and it’s hard to not compare their brilliant (and balanced) use of it with what we’re listening to. Regardless, we need not worry, as Music in you is not a representative sample of what follows. Next up is Body Funk, a single we were teased with earlier back in May. This electro-power track is pretty cowbell heavy, and features a pulsating synth bassline and samples from Hot Streaks 1983 single Body work, resulting in a relatively simple, solid and upbeat number 2 on the track list. Whilst it would certainly make for a guaranteed crowd pleaser in any disco-house DJ’s arsenal, it also wouldn’t sound out of place in any Zumba or boxercise class (ironically, the album itself is released on the Australian label Sweat it out!). Sitting at number 3 is Love for days, featuring Karen Harding and co-produced by German disco-house wizard Boris Dlugosch, who worked with Piontek a couple of years ago to create Keep Pushin’, an exceptionally dynamic and motivational power tune. After much deliberation, Love for Days has earnt our no.1 position in this album, and there’s a whole host of reasons why. Obviously, they’ve done it again – it’s unquestionably got some muscle, reminiscent of what we’ve heard before from the duo. It’s strong without being overly intense, and the smooth and enticing vocals preclude any sudden desire to go and run sprints. When the layered synths do in fact ramp up in the chorus, it’s not for long; the groove junkies are given the disco hit they (we) have been begging for, and we just get time to appreciate the upper ranges of Ms. Harding’s voice before our brains melt. Cruising onwards, we have the albums second single previously released in July, titled Devil in Me – one of the few songs on the album where the vocal hook is the major defining characteristic of the melody. There’s no question why Devil in Me climbed the UK dance charts; the famous guitar riff sampled from William Bell and Judy Clay’s 1968 Private Number is beautifully re-imagined and blends naturally with the soulful lyrics from upcoming London-based artist Joe Killington. It’s nice to see that Piontek lets the vocals take the steering wheel, with a firm and simple drumming pattern in the passenger seat. Devil in Me is probably the primary candidate on the album for which you could listen to and quite easily attribute a soulful tag to it. The lyrics have meaning, depth, and some degree of narrative. Critically, it’s about a man who’s totally infatuated with a girl that’s bringing out the worst in him – but he seemingly doesn’t care, which allows us to come down hard with the soul stamp. “Take my money, leave me out in the rain. To love you, I would have to be insane” Killington sings in the second verse. Skipping merrily along, Take it Easy contains an ever present, pleasant, lounge-style groove, alongside some space-like keys. When combined with the floaty vocals provided by the previously unheard-of NYC duo Crush Club, it truly lends itself to some easy, if not relaxing listening. The title track is a magnificent all-instrumental house number, combining some pretty tantalizing piano chords laid on top of an impressively large array of percussion instruments. Towards the end, the keys make their exit and we’re treated to a feverish attack from drums, cowbells, bongos and the rest. It’s an epic creation that would be well placed to close down any club night. Later down the line at track no. 11, Faithless enter the arena with Tino and together fabricate the dance anthem Let the Music Play. By making use of lead-vocalist Maxi Jazz’s silky-smooth voice in conjunction with a deep house undercurrent, they unashamedly succeed in trancing us out. Funnily, despite being titled Soulmatic, there’s not really a bountiful amount soul to be found throughout the album. However, it couldn’t really be titled Pretty epic odyssey into the distinct and various facets of Disco, including but not limited to groove, boogie, electro- funk, 80’s disco and nu-disco. It doesn’t really have that ring to it now does it, and ‘Discomatic’ sounds a bit, well, 80’s roller-skates. However, that ‘various facets’ joke is founded in truth, and it’s what personally makes this album a true joy. Each song captures a different element of the genre that Mr. Piontek champions, and there’s something in there for everyone. Any given song doesn’t indicate what you may be in store for in subsequent tracks, and whilst some might argue that it feels disjointed, here at Funkin’ Donuts we give it the double thumbs up. Disco is a big, vast sphere, and Purple Disco Machine takes us by the hand and shows us what it’s all about. Take a listen below, and you might surprise yourself by finding a few gems that you really resonate with. As we said, it’s gold – not platinum – but as a debut album it’s bloody marvellous. To give your own advice Mr. Piontek, Keep Pushing on! Yorkshire's aspiring clinical neuroscientist Matthew Price is often found rifling through disco tracks, watching cartoons, or neglecting his degree. He hosts the Funkin' Donuts show with Burst Radio which airs from 6-7pm every Monday, where he brings the latest in nu-disco and groove to the people of Bristol.